A two-woman show portrayed in rapid-fire, comic vignettes, explores the lives of thirty-something, urban, African-American middle class women who search for love, clothes, and dignity in a world that fails to recognize them amongst a parade of stereotypical images. 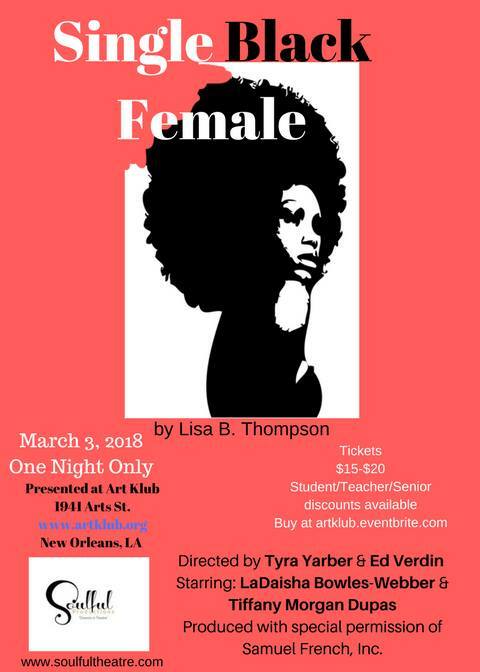 Single Black Female, written by Dr. Lisa B. Thompson, will premier on Saturday, March 3, 2018 featuring performances by Ms. LaDaisha Bowles-Weber and Ms. Tiffany Morgan Dupas. This production is made possible by the traveling theater group, Soulful Productions, Inc. produced with special permission from Samuel French, Inc. Doors Open – 7:30 p.m. / Showtime - 8:00p.m. Soulful Productions, Inc. is a non-profit, traveling theatrical troupe that engages, inspires, entertains, and challenges audiences with diverse theatrical productions and casts. We are a diverse group of artists/directors united by a passionate belief in the value of performing arts and we celebrate the essential power of the theatre to illuminate our common humanity, thereby enriching the cultural life and enhancing economic development in the communities we serve. We strive to put our art at the forefront of the evolving cultures and identities in our society.